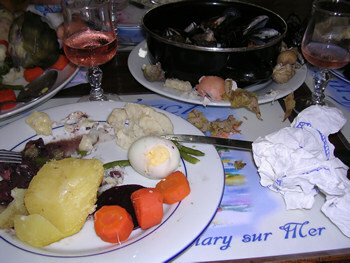 Aioli or aïoli is a Mediterranean sauce made of garlic and olive oil and, in some regions other emulsifiers such as egg. The sauce’s names mean “garlic and oil” in Provençal. Current versions of the French-Provençal sauce are typically closer to a garlic mayonnaise incorporating also egg yolks, and lemon juice. There are many variations, such as adding lemon juice or other seasonings. In France it can include mustard. It is served with steam veggies, fish, seafood, egg.